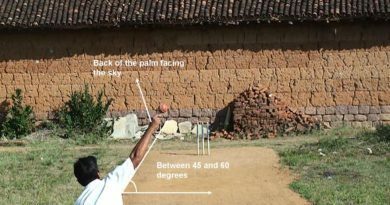 If a ball is moving towards stumps after the batsman playing a shot, now if a batsman handles the ball with a hand for the purpose of protecting his wicket, he will be given out, if the opposition appeals to the umpire. He can stop the ball by his bat or his shoes or his body from moving towards wickets. If a batsman willfully handles the ball with a hand with out the consent of the opposition, he will be given out, if the opposition appeals to the umpire. If a batsman willfully obstructs the field by word or action, he will be given out, if the opposition appeals to the umpire. If a batsman hits the ball twice other than for the purpose of protecting his wicket or with the consent of the opposition, he will be given out, if the opposition appeals to the umpire. 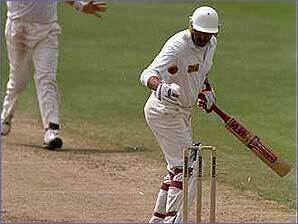 If a batsman hits his wicket by his own bat or by his own body while playing a shot, he will be given out. 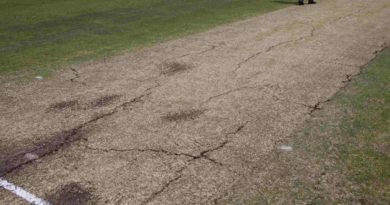 If a batsman’s helmet or cap or his any artificial equipment like gloves, clothes fells on his wicket while playing a shot, he will be given out. 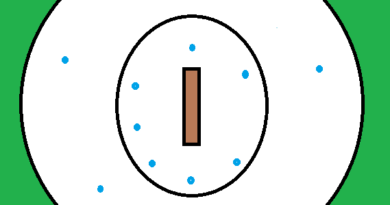 If a batsman gets out, then the incoming batsman from the pavilion has to be at the crease with his partner ready to face a ball with in 3 minutes of the outgoing batsman being dismissed, otherwise he will be given out, if the opposition appeals to the umpire.